Manage the mobile devices and PCs your workforce uses to access company data. Manage the mobile apps your workforce uses. Protect your company information by helping to control the way your workforce accesses and shares it. Ensure devices and apps are compliant with company security requirements. 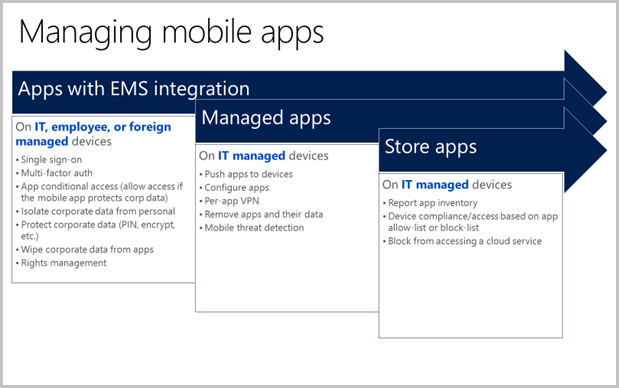 Intune is the component of Microsoft's Enterprise Mobility + Security (EMS) suite that manages mobile devices and apps. It integrates closely with other EMS components like Azure Active Directory (Azure AD) for identity and access control and Azure Information Protection for data protection. When you use it with Office 365, you can enable your workforce to be productive on all their devices, while keeping your organization's information protected. View a larger version of the Intune architecture diagram. You’ll make strong use of device management if you're creating a pool of single-use devices to be shared by shift workers in a retail store. You’ll lean on app management and data protection if you allow your workforce to use their personal devices to access corporate data (BYOD). If you are issuing corporate phones to information workers, you’ll rely on all of the technologies. Sometimes, people think access control to corporate data is a device management feature. We don’t think of it that way because it isn’t something that the mobile operating system provides. Rather, it’s something the identity provider delivers. In our case, the identity provider is Azure Active Directory (Azure AD), Microsoft’s identity and access management system. Intune integrates with Azure AD to enable a broad set of access control scenarios. For example, you can require a mobile device to be compliant with corporate standards that you define in Intune before the device can access a corporate service like Exchange. Likewise, you can lock down the corporate service to a specific set of mobile apps. For example, you can lock down Exchange Online to only be accessed by Outlook or Outlook Mobile. We have seen the term mobile app management (MAM) used to mean any one of those things individually or to mean specific combinations. In particular, it’s common for folks to combine the concept of app configuration with the concept of securing corporate data within mobile apps. That’s because some mobile apps expose settings that allow their data security features to be configured. 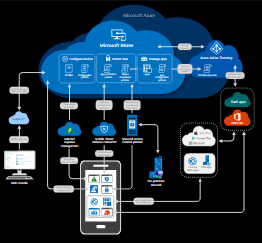 When we talk about app configuration and Intune, we are referring specifically to technologies like managed app configuration on iOS. One way Intune provides mobile app security is through its app protection policy feature. App protection policy uses Azure AD identity to isolate corporate data from personal data. Data that is accessed using corporate credentials will be given additional corporate protections. For example, when a user logs on to their device with their corporate credentials, their corporate identity allows them to access data that is denied to their personal identity. As that corporate data is used, app protection policies control how it is saved and shared. Those same protections are not applied to data that is accessed when the user logs on to their device with their personal identity. In this way, IT has control of corporate data while the end user maintains control and privacy over their personal data. Most enterprise mobility management solutions support basic mobile device and mobile app technologies. These are usually tied to the device being enrolled in your organization’s mobile device management (MDM) solution. Intune supports these scenarios and additionally supports many “without enrollment” scenarios. Organizations differ to the extent they will adopt “without enrollment” scenarios. Some organizations standardize on it. Some allow it for companion devices such as a personal tablet. Others don’t support it at all. Even in this last case, where an organization requires all employee devices to be enrolled in MDM, they typically support "without enrollment" scenarios for contractors, vendors, and other devices that have a specific exemption. You can even use Intune’s “without-enrollment” technology on enrolled devices. For example, a device enrolled in MDM may have "open-in" protections provided by the mobile operating system. "Open-in" protection is a feature of Apple's iOS that restricts you from opening a document from one app, like Outlook, into another app, like Word, unless both apps are managed by the same MDM provider. Also, IT may apply the app protection policy to EMS-managed mobile apps to control save-as, or to provide multi-factor authentication. Whatever your organization’s position on enrolled and unenrolled mobile devices and apps, Intune, as a part of EMS, has tools that will help increase your workforce productivity while protecting your corporate data. The Azure portal is where you can find the Microsoft Intune service. For a quick guide to customize your portal experience, see Getting started with Intune in the Azure portal. Where did my features go in Azure? is a reference to show you the specific workflows and UIs that have changed with the move to Azure. Intune classic groups in the Azure portal explains the implications of the shift to Azure Active Directory security groups for group management. To use Intune in the Azure portal, you must have an Intune admin and tenant account. Sign up for an account if you don't already have one. Check the Azure portal for the latest information about supported browsers. Read about some of the common ways to use Intune. Get familiar with the product with a 30-day trial of Intune. Dive into the technical requirements and capabilities of Intune.